The degree of competition in the global companion diagnostic tests in oncology market for is likely to range from moderate to high owing to the fact that numerous manufacturers are looking forward to collaborate with several pharmaceutical manufacturers, states Transparency Market Research (TMR) in a research report. Moreover, the rising number of vendors in the market with several cutting edge technologies is also anticipated to put the position of established players at stake in the years ahead. The leading three players namely Agilent Technologies Inc., Abbott Laboratories, and Illumina Inc., accounted for a share of 23% in the global market for companion diagnostics tests in oncology in 2016. These vendors are also anticipated to concentrate on partnerships and product innovation to stay competitive in the market in the years ahead. 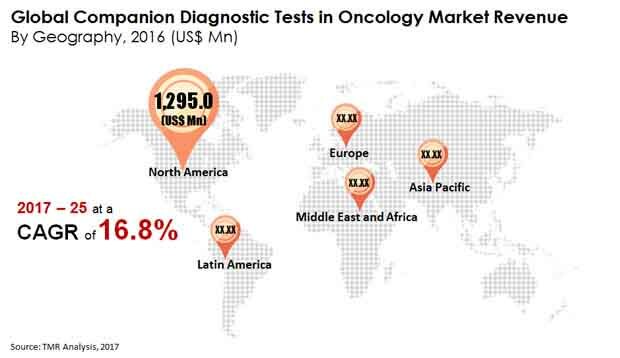 According to a TMR analyst, “The global market for companion diagnostic tests in oncology is anticipated to rise at an outstanding 16.8% CAGR from 2017 to 2025. Rising from a valuation of US$3.5 bn in 2016, the market is likely to touch US$13.6 bn by 2025.” The application of companion diagnostic tests in oncology will be largely in detecting breast cancer. This is anticipated to provide the much needed push to the segment of breast cancer over the years ahead. It is expected to thus exhibit a 17.0% CAGR over the course of the forecast period. Region-wise, the global market for companion diagnostic tests in oncology is likely to be dominated by North America with an approximate share of 37.5% by 2025. The high acceptance rate of novel technologies in the region is one of the core reasons behind the dominance of North America on the regional front. The developing need for personalized healthcare alongside targeted treatments have expanded the development of the worldwide companion diagnostic tests in oncology market. The pharmaceutical industry is step by step advancing toward creating particular treatments to treat various sorts of chronic diseases such as cancer. The take-up of companion diagnostic tests and biomarkers have empowered human services suppliers to offer a scope of appropriate treatments to the patients, in this manner guaranteeing quicker recuperating time. High pervasiveness of malignancy, expanding danger of growth, way of life changes, and regular event of ailments, for instance, Hepatitis are relied upon to drive the worldwide market. The worldwide market for companion diagnostic tests in oncology is likewise profiting by the remarkable diminishment in the cost of drug discovery because of selection of companion diagnostics. These diagnostics are utilized as a part of the procedure of drug discovery as they diminish the time spent in clinical trials by conveyance quicker outcomes in a proficient and successful way. This factor is surveyed to assume an instrumental part in characterizing the direction of the worldwide market for companion diagnostic tests in oncology. The developing concerns about neglected restorative needs are additionally anticipated to boost the demand for companion diagnostic tests in oncology in the coming years as pharmaceutical organizations will concentrate on innovative work to present new medications. The postponed procedures of endorsements for targeted therapies are relied upon to hamper the development of the worldwide companion diagnostic tests in oncology. Moreover, the inconvenience repayment situation has likewise discouraged the worldwide market in the course of recent years. The scattered interest of partners in the worldwide market is likewise going about as an obstruction to the growth of the market.